Angeles, Los — A bright green stripe down the streets of downtown Los Angeles, designed to keep bicycle riders safe in traffic, is being fought by movie studio location scouts who say the safety precaution makes filming in L.A. more difficult and hinders Los Angeles-based “period pieces.” So you can forget about that flashback to 2009 in Transformers IV, America. Those civic do-gooders have ruined everything. 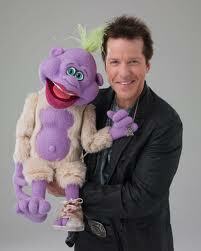 KEEP YOUR DAMN HANDS OFF JEFF DUNHAM. Dunham, Jeff — According to TMZ, authorities have neutralized the source of anonymous Twitter death threats toward successful ventriloquist Jeff Dunham and the comedian is no longer in danger. Allegedly, the perpetrator’s threats included veiled references to wood stains and an unsettling picture of a stack of sandpaper. Express 2, Pineapple — Thought the incredibly entertaining red-band trailer to James Franco and Seth Rogen’s upcoming meta-Hollywood comedy This Is the End would be released a day later on April 2, April Fool’s day itself saw a false, sweded trailer for a Pineapple Express sequel that morphs into a This Is the End teaser. If all this is confusing, just watch the videos. Pretty fun, I think we can all agree. Flav, Flavor — Sources close to the couple are confirming that Flavor Flav’s fiancée Liz Trujillo was not, as previously believed, hospitalized over the weekend due to a drug overdose and that “nothing could be further from the truth.” The source went on to say that Trujillo was hospitalized for “exhaustion.” Yeah. That sounds perfectly reasonable for a fiancée of Flavor Flav. Shorr, Matt — From right here in the TBTS newsroom: our very own Matt Shorr and his lovely wife have given birth to a beautiful baby girl, Olivia May, born Sunday night. Please join us in welcoming her to the world, and let’s all strive to avoid leaving her generation a television lineup still filled with Kardashian offspring.